Orange Co Pound Kills Lost Pet Upon Impound | YesBiscuit! Lisa Storey is a pet owner in Orange County, Florida. When one of her children accidentally left the home’s front door open recently, her senior cat slipped outside. Ms. Storey began searching for her beloved pet, called Sofie, immediately. While canvassing the neighborhood with flyers, Ms. Storey learned a neighbor had found Sofie and taken her to Orange Co Animal Services. But Orange Co had killed Sofie upon impound so Ms. Storey never had any chance of reclaiming her. 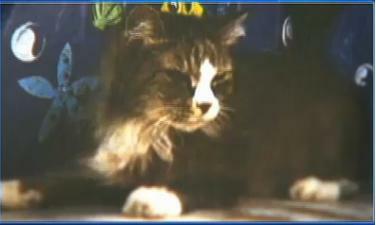 The pound’s vet examined the cat, determined her to be “lethargic and extremely emaciated” and killed her. “It’s not right. I mean, she wasn’t in any pain,” said Storey. This isn’t the first time the Orange Co vet has been involved in a pet killing that made headlines. After the pound oops-killed a 2 year old dog named Hershey who had an adopter waiting to take him home last summer, a local rescuer wrote to Dr. Robert Ridgway, requesting an explanation for the killing. Dr. Ridgway’s highly unprofessional response included no explanation for the needless killing but a number of attacks on the person demanding answers. Channel 9 asked Animal Services if that three-day holding policy depended on whether the animal was sick or healthy. They said hold times are made on a case by case basis. Orange Co Animal Services likes to read the rules and then apply them based on interpretive dance, as they did when wrongly claiming the law required them to kill a beagle named Rufus whose owner wanted him back last year. This is your municipal animal shelter, America. These are the people blaming the “irresponsible public” for the killing and claiming shelters should do away with mandatory holding periods for cats because their owners don’t want them. Fight back. Many shelters clearly aren’t working! How do we make a necessary change? Keep writing bad reviews everywhere, go after those vets, like Ridgeway by complaining to the CA veterinary board on the CA.gov site (or your own state’s official site), share and make as much bad publicity for them as you can, keep up with all FB shelters you have time for, even the kill so you can see what is going on…then report on them, support your NO KILL shelters feverishly! I understand your concern Ann but I think it’s important to recognize that many people believe they are doing lost animals a kindness by taking them to their local pound, often called something benign like “shelter” or “humane society”. People don’t realize what goes on there. This is why I try to call them pet killing facilities when that is their primary function – to help spread awareness. I was out last night trying to find a cat we heard crying and caught a glimpse of. In the end, we never found her/him…and honestly I don’t know what we would have done if we did, because I have no place to keep another cat even temporary. And my housecats are not vaccinated, so….yeah, I really don’t know. Sometimes people just can’t keep strays that they find. Tired, you could always put out a call for help on social media. That’s how I ended up with my last momcat/kittens – someone had found them, but absolutely could not keep them. I had a spare bedroom and a nearby vet, so yeah, I took them in. If there’s an “Urgent Cats” type Facebook page for your area and you’re in that position again, reach out and see if someone can help. Because none of us can do it alone. That’s a good idea, Mikken. I actually used social media to great effect for a starving, feral cat last year. Someone on a forum found her while camping, but had limited internet access. I was many states away, but I was able to network with members of Alley Cat allies, who found a colony caregiver willing to trap and rehab kitty. Social media (and the irresponsible public!) are a great resource that most people don’t consider. Though I’m not sure that would helped last night, since it was past midnight. Generally speaking, we need to be careful not to direct anger toward people who brings strays or lost pets to shelters out of a sincere desire to help. Part of the grotesqueness of our current shelter system is the fact that they have very successfully tricked the majority of the public into believing that they have a sincere desire to HELP animals. After all, shelters don’t WANT to kill, right? So therefore they must only kill when they have no other choice, and surely that wouldn’t apply to a lost pet with an owner actively looking for her, right? It isn’t the good-hearted member of the ‘irresponsible public’ that desires our rage…it’s the shelter system who tricked them and killed a cat because they could. Really, it’s very much like PETA. I’ve known very well-educated animal lovers who donated monthly to PETA. They had NO IDEA that PETA kills every animal they get their hands on…why would they ever suspect such a thing? PETA loves animals, so why would they kill them? The idea is so outlandish that it never crosses people’s mind to investigate. Most people honestly believe that even if their local shelters kills animals, they only do so when every other option has been exhausted, because that’s why they’ve told over and over again. This is not the neighbor’s fault at all. This is entirely the responsibility of the pound. It sounds like the flyers hadn’t even been put up anywhere yet for the neighbor to see, and the neighbor was under no obligation to keep the cat while they made up their own flyers and searched for her owner. While it’s great if you do, if you can’t or don’t want to for whatever reason, you do not have to use your home as a temporary shelter for your neighbors’ lost pets. That’s exactly what shelters are supposed to be for, and many people don’t even realize that most so-called shelters aren’t. And that poor kid now has to live with the knowledge that her kitty is dead because she forgot to close the door… all because they couldn’t be bothered to give the cat fluids, food, and safety until the owner was found. Good job, Orange County Animal Services, you’ve scarred a kid for life. Kill shelters hurt people. Kill shelters are bad for individuals, bad for society, bad for animals. THIS is why we need reform. So families don’t get torn apart like this. I don’t ever turn in animals to the “shelter” and instead give them my phone #, tell them what animal I found, and have them give my phone # to someone looking for their animal that matches the description of what animal I have found. I did have one animal control that a few years later killed someone’s animal because the older lady couldn’t afford the bail on her dog tell me when I called in to give thwem my phone # and a description of the dog I found on a work site 30 miles away “we’ll send an officer out to pick up the dog which is technically the property of our city until the owner is found” and seeing that I had just told them the dog I found wandering down the street was a small dog, who appeared to be partially blind, he was deaf, had screwed up teeth, etc, I was afraid they’d euthanize him. They said “no”, we work with a such-and-such (the breed this dog was) rescue, and if we can’t find the owner (and charge a high fee bail reading between the lines), they will come pick him up…..yeah, right, and I just fell off the turnip truck the night before…. I put up flyers and ran Internet ads trying to find the dogs owner instead because I had a suspicion the dog would be dead within 1-3 days if I had given him to the cities animal control and if no one claimed him. So no one ever contacted me off my ads, and because the animal control wouldn’t work with me on this, I ended up integrating the dog into our family and he lived another 3 years even with all the issues he had. The statistics cited by the California Sheltering report and others about how few animals are reclaimed after a short period of time have a significant flaw IMHO. Few animals may be reclaimed after the first week since animals may already be adopted, sent to rescue/foster, or killed. Thus, few animals may be left to reclaim. In my experience at open admission shelters, approximately 2/3 of dogs and an even higher percentage of cats were strays. Based on most large shelters reclaim rates, a large percentage never make it back to their homes. I do get the trade-off between reuniting owners with lost pets and shelter length of stay. However, better data is needed to support the claim few owners reclaim their pets after the first few days. So when advocates say “well, only x% of owners reclaim their pets”, they’re mutilating the statistics and making a blatantly false statement that implies that cat owners just don’t care about their pets. It basically allows them to erase the owners because, well, they obviously don’t care anyway. It also fails to take into account that at many shelters, the owner may never have a CHANCE to reclaim. Sofie’s owner would contribute to the stats suggesting that owners never reclaim…even though she made every effort to do so. Thank you to Tiredcaregiver! Hate to see stats misused/ mangled to spread misinformation. And my sympathy for the poor kid who’s going to feel guilty as well as sad, not her fault at all but it must be heartbreaking.